You are here: Home / Tools / Storage Shed / How To Choose The Best Outdoor Storage Sheds? Are you planning to have a place to store your lawn mower, pool furniture, bicycles, or gardening tools? Is your house filled with clutter and somewhere secure and safe to store these belongings, which you can’t bear to live with, is what you need? If these are your questions, then, your answer is “Sure!” The best outdoor storage sheds will be an ultimate solution for your outdoor storage problem. Purchasing an appropriate garden shed is one of the best things you can do to help protect your valuable outdoor items. Now, if you need to choose the best outdoor shed for the garden, then, this guide will give you some useful tips on what you need to consider. 1 How to choose the best outdoor storage sheds? 1.2 – Outdoor storage sheds’ design and the design of your house. 2 When is an outdoor storage shed not enough? There’re a lot of factors that you need to consider before purchasing, including design, the material used, price and size. All you need to do is just narrow down the options to find out the best choice for your individual case. Do not let the cost of storage sheds be your determining factor. If you are attracted by the cheap cost, you will immediately ignore and put blinders on alternatives. Outdoor sheds sided with vinyl and cedar, which are sidings with the highest quality, are just a little bit more expensive (about a few hundred of dollars) than outbuilding sided made of low-quality materials. You should consider how much these dollars can buy before rejecting the vinyl or cedar. – Outdoor storage sheds’ design and the design of your house. Remember that those structures aren’t only for storing your belongings away. Besides their usefulness, their appearance also affects the all-inclusive appearance of the property that they are installed on. Therefore, you should choose a design, which can complement your house. Choose a unit with rustic design (for example, batten and board) if your house has country style. On the other hand, if the style of your home is more formal, then, a shed with some formal features is a good choice (for example, if your home has arched windows, then, you can carry this theme over your outdoor storage building). There’re a lot of uses for outdoor sheds. Do you intend to store your pool accessories, sports equipment, bikes, garden tools, or lawn mower? Here are some of many outdoor storage sheds available. Plastic storage shed is the most affordable one. It is usually made of plastic with high quality. It is able to resist humidity, moisture and rotting as well. Nevertheless, the main disadvantage of this type is its limited selection of visual appeal and style. Vinyl storage shed tends to be much more durable since it will not rust, chip or dent. It is specially meant for long-term storage. This kind of shed is an ideal solution for your garden and backyard storage issue. Metal storage shed is among the most typical solutions for outdoor storage. Since it is easy to assemble and very lightweight. Nowadays, it requires less maintenance since it does not need to be painted and it is also rust-resistant as well. Typically, it seems to be the least expensive one. Resin storage shed is among the newest outbuildings on the marketplace. Thanks to its free-maintenance, it is one of the most popular options available. You need not worry about your storage shed rotting, fading, cracking, or rusting. Moreover, there is no need to repaint this kind of shed as well. Wooden storage shed is such a traditional one. This type of shed can be customized completely in different shapes and sizes. However, it still requires much more maintenance than other kinds of outbuildings. On the other hand, it can be a charming addition to your backyard. Your options can be endless, from a ranch, lean-to, barn and different loft styles. Besides, you can also paint it so that it can go well with your house. The smallest storage shed is usually 3-by-7 feet. This size only provides enough room for the wheelbarrow, push mower, or basic gardening equipment, however, not much workspace. Medium storage shed, which is about 10-by-10, is able to accommodate a riding mower and full range of your garden supplies. Moreover, it is also large enough to offer space for your small projects. You will need professional installation and a big yard for a large storage shed, which from 15 to 20 feet by 20 to 40 feet. Nevertheless, some larger models give perks such as lofts for extra storage. This selection will narrow your options immediately, especially when regarding of budget and size. In case you want all of the work to be done for you, just choose a storage shed from the home improvement store in your local and then, ask if it can be delivered and assembled. However, if you are handy, you may want to save money by ordering a building kit of your outdoor storage shed that includes assembly instructions. The little touches may make a big difference. Some sheds feature cupolas or French doors. You can also add touches such as weathervanes, shutters, or window boxes on your own. Just remember that you must look at your outdoor storage shed every day for a foreseeable future because your attention to the details can make a big difference between eye-opener and eyesore. For a practical note, build or purchase a pressure-treated ramp so that you can access your shed easily. When is an outdoor storage shed not enough? This unit is made to precisely fit to a corner. It is 3 feet in height, 3 feet in width and 2 feet in depth. Another ideal option to solve your space problem is adding a horizontal shed (3’ x 5’ x 4’) or a vertical shed (5’ x 3’ x 4’). Purchasing an outdoor storage shed along with a loft can greatly enhance the storage capability, thus, allowing users to store supplies, which are rarely used, overhead. Do not purchase a shed of small size just because it costs you the least. Consider your storage demand. Buying a shed of larger size from the beginning is better than having to have it replaced later. Give significant consideration to security issue. Generally, household insurance doesn’t cover the loss of equipment that is stored in a garden shed. This is because most of the locks will be broken or removed easily by thieves. You shouldn’t store expensive tools or high-quality equipment in your shed, especially when your garden is within easy access. Most steel sheds are bolted to a paved base which is well-prepared. Thus, their structure gives more security. I think you should equip the base with a damp-proof membrane for better protection of your materials. Most sheds made of timber need to have a prepared paved base to rest on. In this case, you should raise the base using brick battens. (Here, I highly recommend engineering brick because it is particularly good.) This helps keep floor timbers off the damp ground, thus making them last longer. For some models, they even go with a steel base. Accessibility. Ask yourself what you will use your shed for. If it is jus a garden shed, then place it near the garden. But remember to choose a proper location so that it won’t block three hours of invaluable sunlight. If you intend to store the snow blower in your shed, I’m sure you won’t want to tromp across the snowed-up backyard, then struggle to return to your house. It will certainly tear you down even before you start all your clearing task for the driveway and sidewalk. Aesthetics. Compared to the snow threat, the appearance of your backyard will surely matter you more. Some people go for the latent and harmonious beauty standard, with their building blending into the surroundings. Others prefer their building to be part of the exterior décor and want it to stand out. Whichever way you opt for, it will impact the location of your shed. Setback. The setback means the distance from your property line to your structure. You definitely don’t hope to make a scene with your next-door neighbor nor the local building inspector. So make sure you leave enough space between your shed and the yard of your neighbor. If any question arises, contact your local city/county offices or your HOA. In addition, remember to give sufficient space for your mower to move along the fence and the shed–even when you’ve upgraded to a MegaMower. Longevity. You can prolong the life of your shed if you put it where there’s no perpetual damp and keep it away from the direction of the neighborhood watershed. Plus, keep an eye on low tree branches since they will scrape the roof and or sides when it’s windy, damaging the roof and paint of your shed. Also, in case you’ve got a sprinkler system, bear this in mind: your shed won’t receive the same effect as your grass when you water. Utilities. You should not place your garden shed above buried power system or other utilities. By calling “Miss Utility” of Virginia – dial 811, you can have your utilities marked for free. Access. Take into account access for delivery. You can use a crane to get your shed placed. However it is not the most economical option. In case you cannot deliver your shed into the backyard, a cheaper option is to get it built on the spot, but be cautious since some builders don’t offer this. Here are two bonus tips so that you can add finishing touches to your building placement. Doors. The design of your shed as well as the way you turn it is worth your concern. Doors should be positioned so that they give the highest utility. For instance, having the double doors placed against the fence is never a wise choice if you have to drive your mower inside. (Note that you will probably need space for a small road.) Moreover, the doors should be positioned facing a fairly level ground. If they open up to a downhill slope, the road won’t work properly. Parallel. Lastly, measure the angle of your building placement. You can do this by getting it to parallel the house or the fence. If it doesn’t, try to readjust the placement. The YardStash IV Storage Shed Tent is a portable storage shed and innovative approach to the traditional wood, metal, or plastic storage shed and its price is very reasonable. 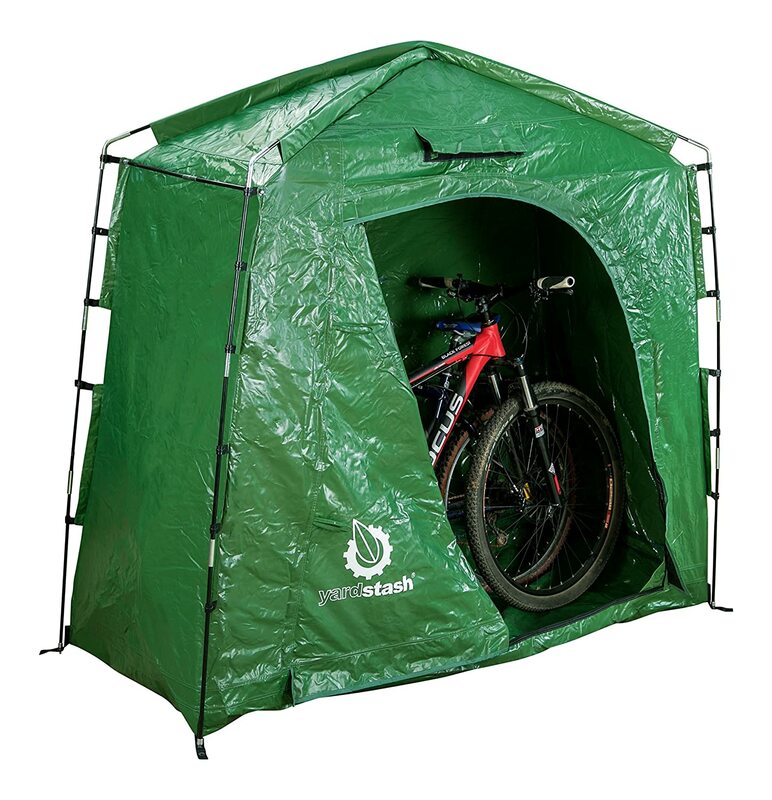 The shed tent is compact and is a perfect option to store your materials outdoor. The tent’s construction is from thick, heavy duty, tear-proof, weatherproof, UV-resistant and industrial-grade vinyl tarpaulin material. Thanks to such a quality and well-designed material, you can be certain that your shed will endure weather extremes. Its body is made of PVC lined polyester, which is promised to give your tools and equipment a perfect shield against snow, dust, rain, and pests throughout all four seasons. When it comes to security, you can easily lock the tent. All you have to do is to attach the suitcase lock to its zipper. Opening the storm flaps is just as easy. Plus, this shed comes with a front mesh vent which helps stamp any condensation buildup. Its space-saving footprint measures 74 x32 x 68 inches, which means this YardStash Shed can house with ease about three adults bikes, gardening tools with long handles, and other small-sized outdoor items. 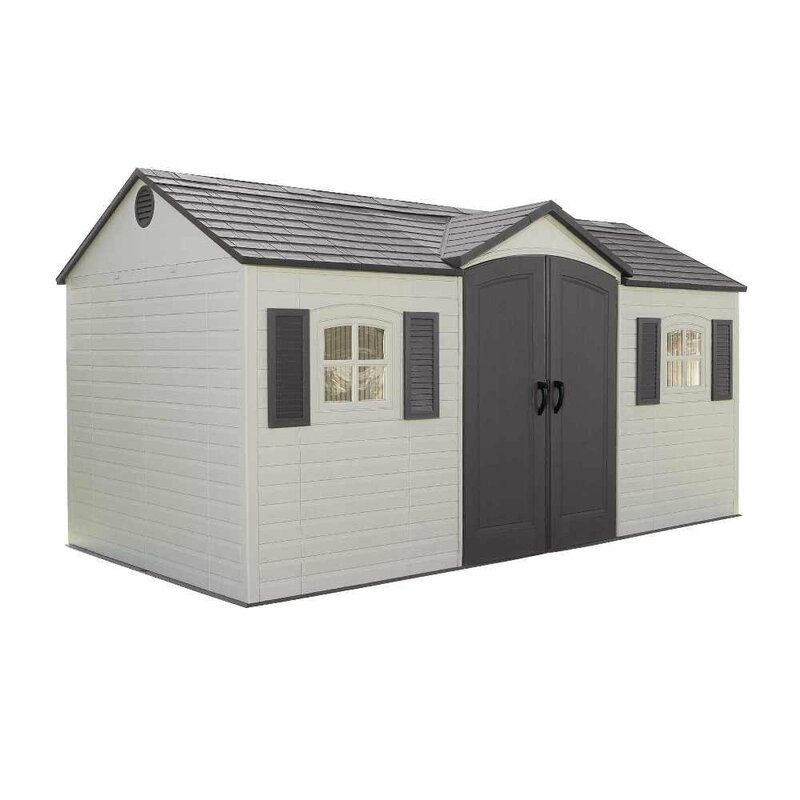 With such a compact size, I think this shed is an ideal option if you own a small yard with minimal space. Especially, you could even bring it with you during your camping for additional storage space. Even though this YardStash can just house a couple of bulky things, its price is extremely affordable. So, you can consider purchasing two sheds for best storage of all your outdoor equipment. There are 2 sizes available for you to opt for. Plus, this model requires hardly any maintenance. So, it’s really a good choice! If you’re looking for a mid-range and solid shed to store your gardening tools and materials, this one surely satisfies all of your needs. It doesn’t go with fancy bells and whistles, yet it is constructed with robust and double-wall resin. This material is resistant to rusting and rotting. The shed also features a roof reinforced with metal and a durable floor for better protection of your things against the elements. The construction of the roof frame is from steel trusses. They are quite sturdy, and the resin panels simulate shingles. Resin plastic is particularly strong, resistant to water, UV, fading, and kryptonite as well. Here, as you can expect, if someone wants to get inside this resin shed, they can cut through its wall using only a razor knife. So, remember not to store your valuable jewel in this shed. Anyway, it is a wonderful option for storing typical outdoor stuff. For security concern, this shed comes with metal handles that can be locked. Also, there are windows fixed on the doors for the light to shine inside as well as a vent for air to flow through. 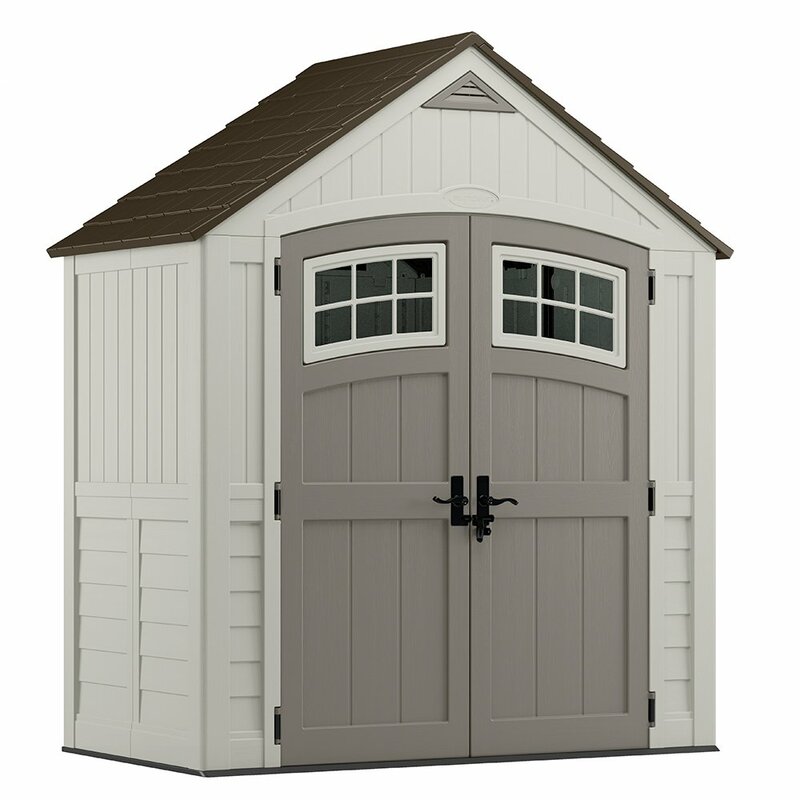 The measurement of this shed is 7′ 4-1/2″ x 3′ 11-3/4″ x 8′ 6-1/2″. Thus, it has enough space to accommodate your gear. Moreover, thanks to its double doors, you can get in and out easily. If you want to equip the shed with shelving, hook as well as basket accessories, you can buy them separately. Multi-wall panels are well-designed to give more strength and durability. Its construction material is water resistant and UV resistant to help it withstand the elements. The double-wall resin is durable and sturdy, featuring a texture of wood grain. Door windows with attractive design and functional vent for good air flow. You have to prepare the site and construct the foundation. 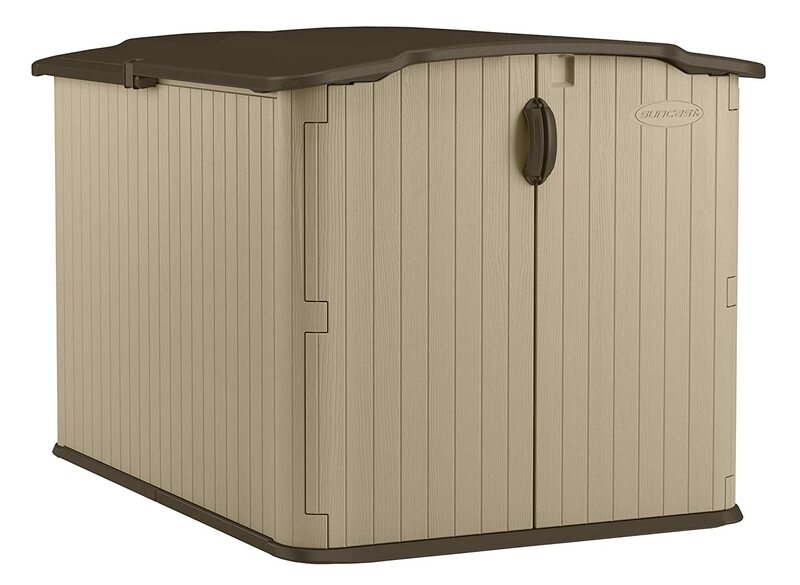 Lifetime’s 8-foot wide Outdoor Storage Sheds are made of durable polyethylene and their wall is both dual and high-density. In addition, the sheds are reinforced by steel and low-maintenance. So, this product is ideal for your storage needs. On the grounds that it the shed’s walls are covered with an extra layer of UV, despite any kind of weather, the material will not rust or fade. Another bonus point is that you don’t have to worry about the stagnation of rain and snow thanks to the roof reinforced with high-pitched steel. On each side of the shed, there are two polycarbonate windows which are shatter-proof. This storage makes it easier for you to find your equipment or tool because the two skylights provide you with enough light. Moreover, the shed becomes cooler thanks to the two screened vents. One thing special of the Lifetime storage shed is that you can change the storage space inside in order to match with your storage needs. You can do this as the shed provides you with a plenty of storage shelves. Last but not least, you will feel much safer when using this shed owing to the steel reinforced door which can be locked. The floor is free of slip, chemical, oil, and solvent. Steel reinforced doors can be locked easily. Instructions are quite difficult to understand. According to me, this shed doesn’t look like a garden storage. Nonetheless, it makes me feel like living in a house with two doors and two windows. That is really amazing. If you are looking for a shed with a lot of storage space, this shed is absolutely suitable for your choice. To be honest, this shed is strong and durable, as well as its appealing design and appearance will beautify your backyard which usually looks boring. You spent much time searching for a tool whenever you do something related to your garden. However, with the Lifetime 6446 has many peg strips and units, the tools are organized perfectly so that you can easily find them. 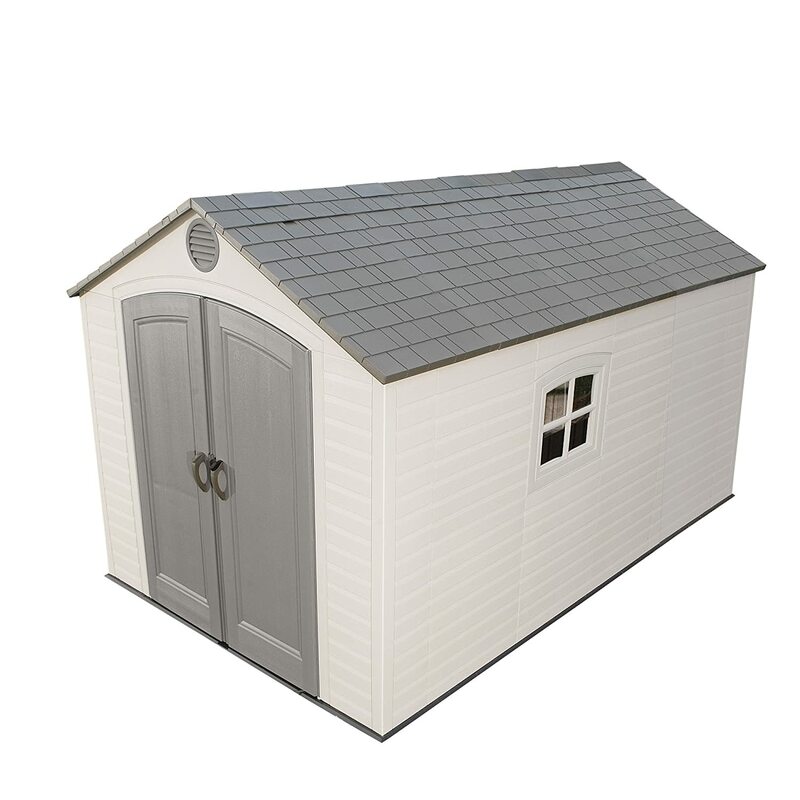 This attractive shed is made of high-density polyethylene (HDPE) plastic and strengthened by powder-coasted steel. Therefore, people use this shed to weather the storms for years. In nature, plastic sheds are thought to be flimsy and light. However, you will be surprised by the weight of this shed: up to 752 Ibs (340kg). One thing I love this shed is that I don’t have to consume my time painting it. Made of dual wall UV, which is protected by high-density polyethylene. Parts may arrive at different times. The Suncast Glidetop Slide Lid Shed is placed under your fence line. Thus it does not take up much space. However, you still have a big storage space to store many things such as bikes or gardening tools regarding patio furniture or a wheelbarrow. This shed is made from resin (plastic) and reinforced with steel. Thus it is sturdy enough for your usage. Owing to its toughness, some people even use it to raise chickens, dogs, goats, and turtles. However, after many years, it still looks good. Another strong point is that this shed has a quite flat roof, which makes it ideal for properties that have to follow strict regulations. Strict regulations mean that no structure is allowed to be seen over the level of fence. The Suncast Glidetop Slide Lid Shed only takes you from one to two hours to set up and assemble all parts with some necessary minimal tools. If you worry about your gardening tools, you can lock the shed with a pad lock, and you will feel more secure. It is easy to maintain and has a long-life span. If you want to protect and increase the number of your valued outdoor items, buying the top outdoor garden sheds will be the best decision. They provide you with many smart solutions for your garden storage needs. Because the sheds have many sizes and designs, you can choose the most suitable one for your available space. For example, you will be suggested to buy large sheds if you have a lawn mower of gear to bicycles. After you read my review, do you find the best shed for your yard? You want your shed made by wood to look natural, resin and plastic to be light or metal shed to be long-lasting. Let’s me know, and I will give you advice. Thank you for all the tips on how to choose a shed. I really like your tip about choosing a design that will compliment your house. I think it would be really smart to choose a shed that matches our home. It would really add to our property.